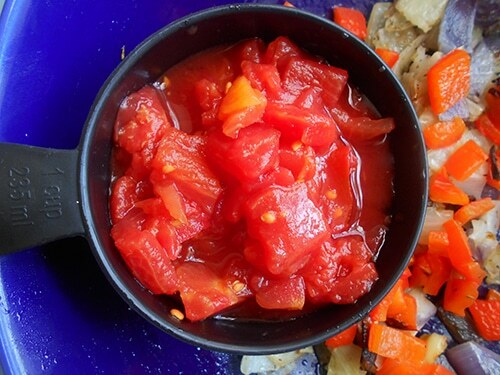 This is a delicious way of making salsa. 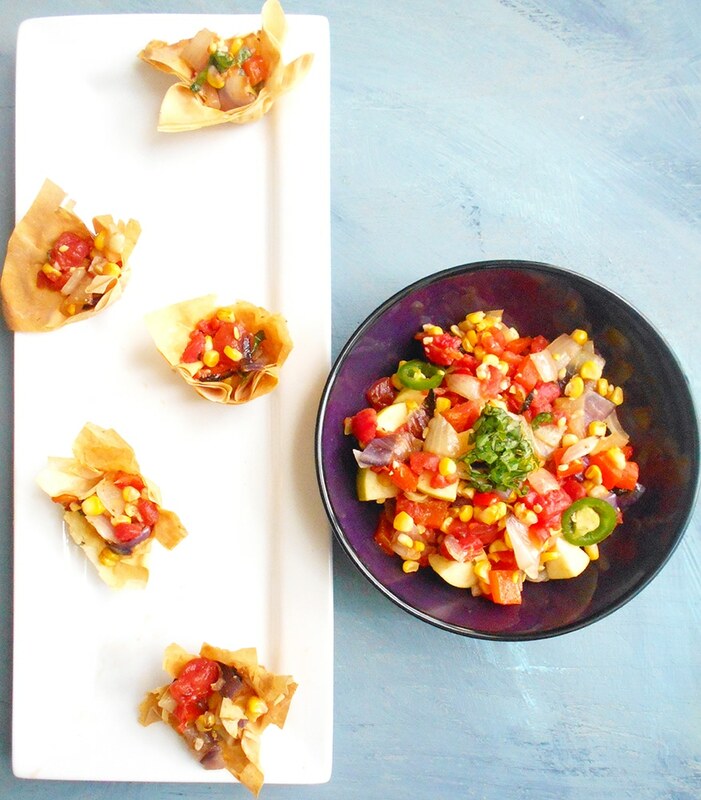 Roasted corn is blended with other veggies to make a quick salsa as a game day snack. Tailgating parties are a tradition here in Florida and the rest of the Country. I don’t know how the rest of the country does tailgating parties, but in Florida we tend to go ALL out for each tailgate party. Most of the tailgaters will show up with painted faces, hair and hands. The painted chest is also very common and everyone is happy to wear the love of their team on their sleeve, quite literally. A tailgating party without food is a like a birthday party without cake! I am happy to say that I haven’t attended a single tailgating party that didn’t have food and alcohol flowing freely. My favorite foods to eat at tailgating parties are finger foods. They are easy to consume and always very delicious. Nothing says Tailgating like salsa. There are so many varieties of salsa that sometimes it is hard to choose. Having salsa in mini and ready-to-eat cups makes it very convenient. The cups turned out better than having chips for the salsa. I have made tomato salsas in the past for tailgating parties and they always go over very well. 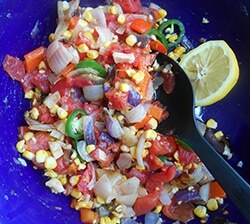 My 5 tomato salsa is the most requested salsa recipe for any tailgating parties I attend. Tomatoes, in all forms, are perfect for salsa. Being a tomato aficionado, I can tell when a tomato is packed. The red California tomatoes are some of the best tomatoes in the world. They are juicy, ripe and plump. 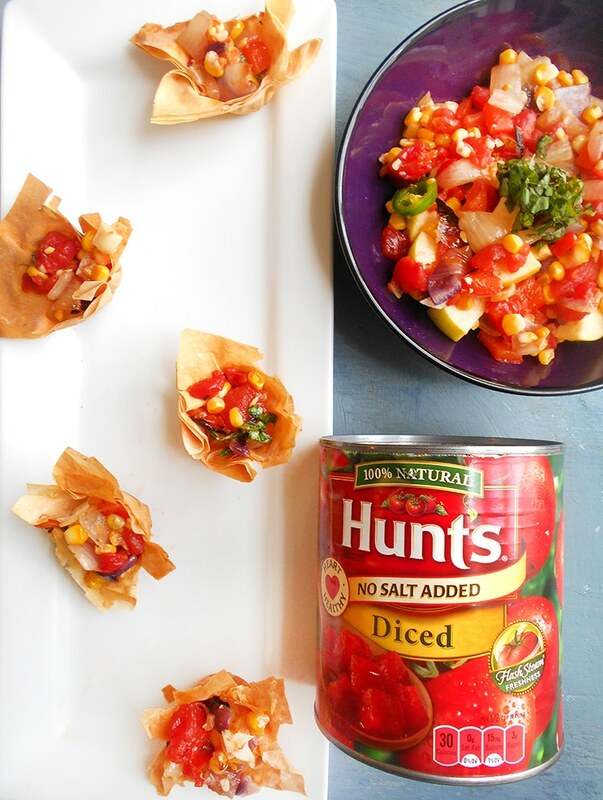 What is your favorite kind of Hunt’s tomatoes? 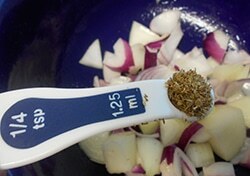 3) Add ¼ tsp of oregano to the garlic and mix well. 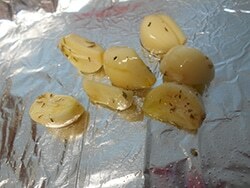 4) Cut out about a 4” by 4” pieces of foil and place the garlic mixture in it. I like to leave the oil in the bowl. 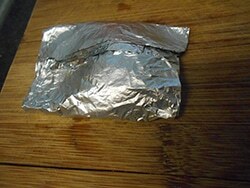 Fold all sides and turn it into a pouch. Set it aside. Also set aside the bowl with any left over oil. 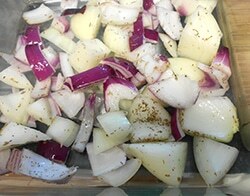 6) Add 1 tbsp of extra virgin olive oil to the onions. Don’t worry if it is a lot. The extra oil will be used up later for the corn. 10) Remove the husks from the corn. 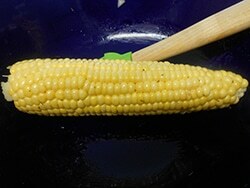 For this recipe, I used a whole ear of corn. 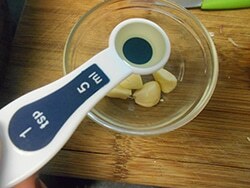 Take the left over oil from the garlic and put it into the bowl that had onions. 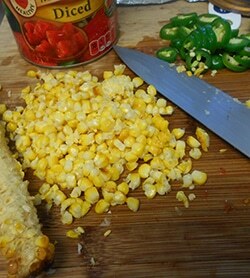 Baste the corn and half a red bell pepper. There should be enough oil left over to baste both veggies. 11) I roasted them in the oven because I don’t own a grill. If you have a grill, use that instead. You can roast all the veggies in this recipe. I like to roast them separately because it’s easier to cut them when we assemble the salsa. 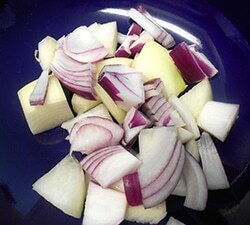 12) Remove the onions after they have charred around the edges. Remove the garlic too. Let them cool for a few minutes and then roughly chop the onions and the garlic. Put them in the mixing bowl. 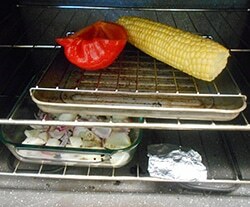 13) Once you have removed the onions and garlic, turn the oven to broil and broil corn and peppers. Turn the corn until it is brown on all sides. Remove them from the oven and cool for a few minutes. 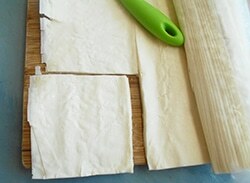 14) While the corn and pepper are cooling, cut pastry sheets into 3” by 3” squares. You will need about 60 of these squares. 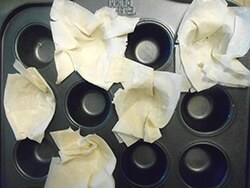 15) Using PAM cooking spray, I sprayed the mini muffin trays and placed about 3 per slot. I did a bad job of molding them to the shape of the muffin hole. I like them rough and non-symmetrical. Also spray a small amount of PAM cooking spray inside the cup shapes. I made about 20 and still had some roasted salsa left over. Toast for about 5-7 minutes or until the cups are brown. 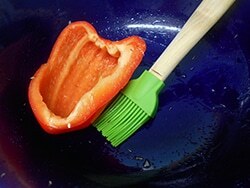 16) Remove the skin from the pepper and chop them up roughly. Put them in the mixing bowl. 17) Remove the kernal by using a knife. It is much faster this way. Put the corn in the mixing bowl. 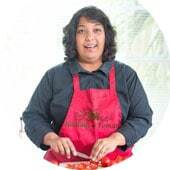 18) Add the Hunt’s diced tomatoes to the mixing bowl. Just look at how vibrant and juicy these tomatoes look. YUM! 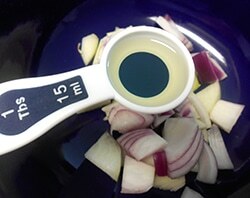 19) Add 1 Jalapeno cut into circles. 20) Add 2 tsp of lemon juice. 23) Mix well. Make taste adjustments at this point and set aside. Place the salsa in the cups at the time of serving because they will get soggy. This is a quick salsa recipe for game day. My tailgating parties always have this quick salsa recipe. 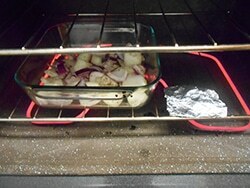 Cut out about a 4” by 4” foil and place the garlic mixture in it. I like to leave the oil in the bowl. Fold all sides and turn it into a pouch. Set it aside. Also set aside the bowl with any left over oil. 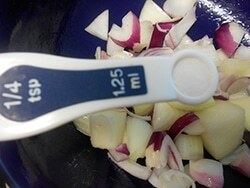 Add 1 tbsp of extra virgin olive oil to the onions. Don’t worry if it is a lot. The extra oil will be used up later for the corn. Remove the husks from the corn. For this recipe, I used one whole corn. 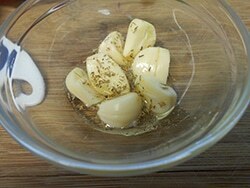 Take the left over oil from the garlic and put it into the bowl which had onions. 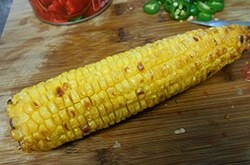 Baste the corn and half a red bell pepper. There should be enough oil left over to baste both veggies. I roasted them in the oven because I don’t own a grill. If you have a grill, use that instead. You can roast all the veggies in this recipe. I like to roast them separately becaue it will be easier to cut them when we assemble the salsa. 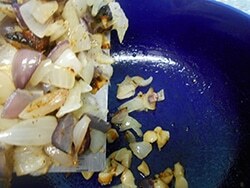 Remove the onions after they have charred around the edges. Remove the garlic too. Let them cool for a few minutes and then roughly chop the onions and the garlic. Put them in the mixing bowl. 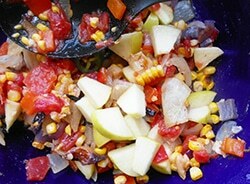 Once you have removed the onions and garlic, turn the oven to broil and broil corn and peppers. Turn the corn until it is brown on all sides. Remove them from the oven and cool for a few minutes. 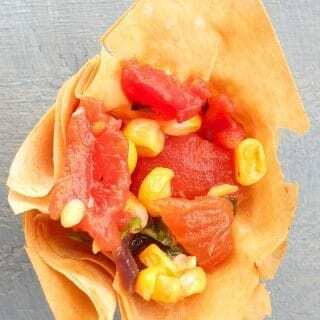 While the corn and pepper are cooling, cut pastry sheets into 3” by 3” squares. You will need about 60 of these squares. Using PAM cooking spray, I sprayed the mini muffin trays and placed about 3 per slot. I did a bad job of molding them to the shape of the muffin hole. I like them rough and non-symmetrical. Aslo spray a small amount of PAM cooking spray inside the cup shapes. I made about 20 and still had some roasted salsa left over. Toast for about 5-7 minutes or until the cups are brown. 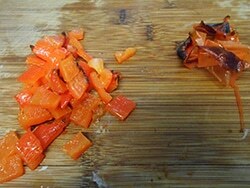 Remove the skin from the pepper and chop them up roughly. Put them in the mixing bowl. Remove the kernel by using a knife. It is much faster this way. Put the corn in the mixing bowl. Add the Hunt’s diced tomatoes to the mixing bowl. Just look at how vibrant and juicy these tomatoes look. YUM! Add 1 Jalapeno cut into circles. Add 2 tsp of lemon juice. Mix well. Make taste adjustments at this point and set aside. Place the salsa in the cups at the time of serving because they will get soggy. This is one of my favorite types of salsas! Love the idea for creative “chips!” I don’t think I have ever made the same kind of salsa twice – love how you can have so many variations of one thing. Always interesting!! 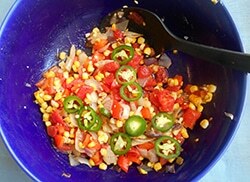 Corn salsa is one of my faves! I could eat it on anything! Can it hurry up and be corn season already. This salsa looks too good not to make. Thank you, Christie. Summer is almost here. I can’t wait either. Love roasted corn (and salsa)! What a fantastic bite! Yummy what a delightful recipe I love Hunts my favorite tomatoes. And those cups are such a clever idea. What a great idea! 🙂 I’ll make this for our next party. Thanks so much for sharing it! Thank you, Linda. How much fun is it to tailgate an Ole Miss game! Although, I have to say “Roll tide”. Sorry! The cute sundress attire sounds like so much fun. Send me pics of the party and the salsa. Thank you. These are just so cute! 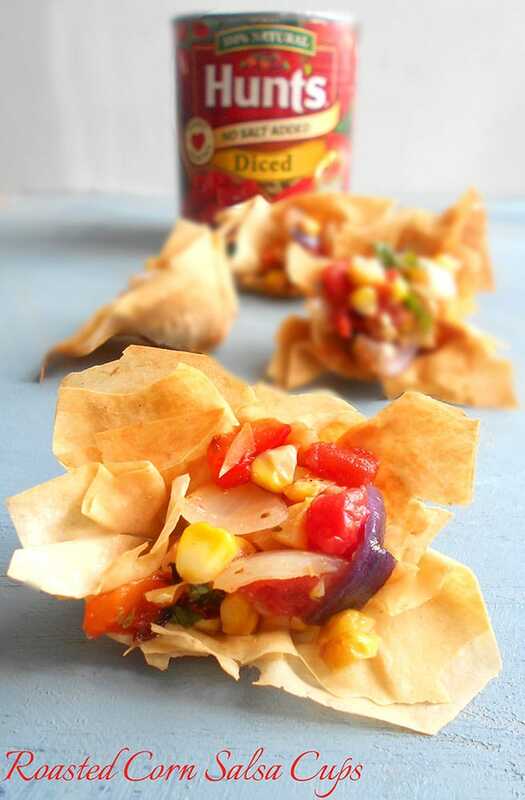 These would make the perfect appetizer! 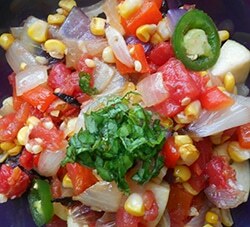 This is right up my alley too because I love corn and salsa! Thank you, Vegan 8. Corn and salsa were a match made in heaven. 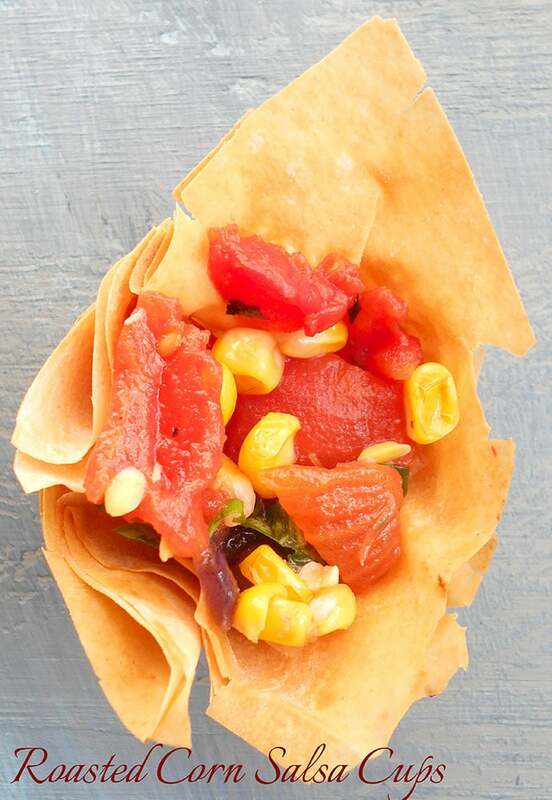 Such a great idea to serve a fresh, juicy salsa in crispy, crunchy edible cup. They look delicious!